Summary: The BeGrit wireless driveway alarm is one of the most inexpensive alarms on the market. Even though it’s slightly better than other driveway alarms in this price range, it’s made with a low quality sensor that doesn’t always work. The Guardline GL2000 and the Dakota 2500 are two high quality driveway alarms that I recommend. The BeGrit wireless driveway alarm uses a motion sensor to detect people and vehicles. The alarm system includes 1 receiver, 1 PIR motion sensor (including battery), 1 adapter and user manual. Please not that you will need to buy batteries for the receiver separately, if you decide not to use the adapter. The PIR motion sensor will send a notification to the receiver whenever it detects movement. Next, the receiver will notify you by a chime. It’s always a good idea to keep the motion sensor away from the sun, high winds or heavy rain (these factors are known to produce false alarms). 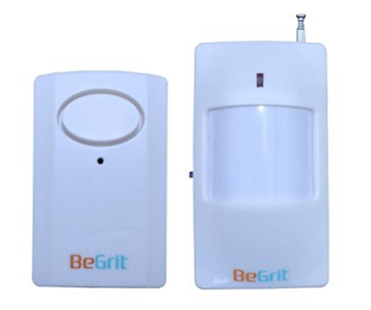 The BeGrit is one of the most affordable wireless driveway alarms on the market. However, it’s made with poor components that do not last a long time. Also, the range between the motion sensor and the transmitter is one of the shortest I’ve seen. If you’re looking for a high quality and reliable driveway alarm, check out the Guardline GL2000 or the Dakota 2500.